Good Morning everyone. How are you? It’s a scorcher in Izmir, Turkey today with a high of 88 degrees. For the first time this season, another cruise ship is docked alongside us in Izmir (as it not part of the family, so it gets no free advertising ). This however means that we will have 5,000 passengers returning at the same time and they all have to pass through a terminal that’s as small as a supermodels lunch. I have extra staff outside and hopefully things will go smoothly but I fear there may be a bit of a delay to our sailing…….we shall see. Heidi is back from the pier and now I am going let her type what has just happened. I was not going to say who the ship next to us was but I will now, it was NCL’s the Norwegian Dream. Listen to this. Hiya! Heidi here. Just got back from the pier. John was worried that there would be a very long line with so many guests coming back at the same time. Luckily this didn’t happen, so instead of having to control the crowd, we had the time to welcome our guests back to the pier and the ship. We had a group of staff from entertainment, shore excursion staff and pursers at the entrance of the terminal, greeting the guests. As our guests and the NCL guests were merging in to the terminal together I saw a lot of NCL guests who recognized me and said they missed me (and oh, yes, I suppose they said that they missed John too…..his head is so big now, that he won’t fit through the door to go to the Repeater’s Party in a minute). I also saw our friend Kuki, one of the editors of Cruise Mates and a good friend of John’s. We will see him and a group of Cruise Mates again here on board in November. The temperature really has picked up now, yes, the shorts came out today, not sure Turkey was ready for my white legs. Well, the Turkish men were looking anyway, I think I am going to have to dye my hair black tonight. Or maybe I won’t and let John be jealous. That’s all for me, I had fun out there with all our guests, the Mellow Yellow group came back from Ephesus and the Terraced Houses tour and told me they had a great time. It’s a very special tour, the only one that actually goes inside the Terraced Houses, a great tour for guests who have seen Ephesus before. Anyway, I will just keep going, as I feel like I am writing to family by now, every cruise I meet so many of you and get to see faces to the names. 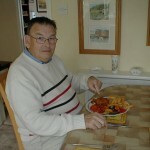 Here is a photo that just popped up as I was typing this blog of my Dad, eating fish and chips. I hope he has more luck with his fish than I did with mine. I will let you all know if it effects him in anyway tomorrow. Time for the Q & A……….Hooray. CHAZON – Thanks for the report on the Holiday. I am sorry Steve was not more visible but happy to hear that B Rad his assistant was so enjoyable. It doesn’t take long to become a cruise fan and you are joining the millions of fans around the world who have discovered this amazing way to take a vacation. I hope I get a chance to meet you and your wife soon. HIJEAN – I am still blaming Francesco the Fish (it was Italian) for my bout of sickness but I guess I will never know. It has put me off enjoying anything from the sea, unless Angelina Jolie happens to be going for a swim in which case I would be in my Speedos before you could say”Brad Pitt’s a big girl.“ Keep counting down, your cruise will be here before you know it. Thanks as always for reading the blog thingy. BARB AND HER BIG BEAR – Thank you for the joke on behalf of us all. Heidi did catch up with our “scared of going to Istanbul friend“ and hopefully she will realize it will be OK for her to be blonde and proud in the Grand Bazaar tomorrow. Thanks again for your kind words towards Heidi and I and see you soon. LINDA AND MIKE THE WATT – Your gift of sugar-free candy is going to be very gratefully received, so thank you so much in advance. Heidi will share that with me so no need to bring her anything. Ahhhhhhhhhhh, Aston Martin, I must admit that is still one of my dreams and I will keep giving the company free air time as hopefully one day they will realize that they should give me one for free. See you in November. RENEE – If a comment from me makes you behave like a schoolgirl, don’t worry about your husband. If you want to put that school uniform back on, you go right ahead! And with that comment, I am firmly back sharing accommodation with a canine. It’s funny how some posts on the various sights tend to exaggerate on some topics and taking hours to get ashore in Cannes is one of them. If you have a private tour in Cannes at 9:30 am you should be fine. We start tender ticketing at 9:15 am so you will be ashore by 9:30 am to meet your tour. The operation is so smooth and last cruise we had 2,700 guests ashore in two hours……..pretty good even if I do say so myself. Thanks for reading and I hope I have made you feel “school girlish again.“ Time for Math’s! BIG ED – After the last few days my underwear does having racing stripes and they are definitely a result of “going faster.“ I agree, there must be a blogger who is reading this with a contact at Aston Martin who wants to make me happy. Tell Mrs. Big Ed that you and I will need some guy time on the ship together, plus an hour to un wedge ourselves from the booth. See you soon mate and congratulations on the fantastic photo album. ZSOLT AND MARIA – Thank you for allowing thousands of us to read your beautiful and heartfelt words. I have noted your address and will be mailing a DVD to you later this cruise. I am sorry to report that the photos from last cruise have been recycled and I should have thought to find them for you before. My apologies. Please can you tell your Mum that we are all thinking about her and I will put some photos of the ship and the ports in the same envelope as the DVD. We will see BOTH of you on the Splendor and I will have a big WELCOME HOME cake ready for MUM. See you soon. SOUTHERNDREAMS – Sounds like Bonnie Prince Charlie and I have a lot in common. Are you at your summer home yet? DAY 1…………………..EVENING GONDOLA TOUR. This is a must, of course, and booking through the vessel makes sure you don’t fall into the hands of a maverick gondolier who will charge you the earth and give you very little. Our tour has a guaranteed 40 minutes in the gondola which will glide you down the candlelit canals of this most romantic of cities. Afterwards you can sit at the cafes on St Mark’s Square and listen to some beautiful classical music. DAY 2………………..MURANO AND BURANO. Venice is so much more that St. Marks. Here you will visit the two outer islands and of course the stunning Morano glass factory and watch master glass blower Senior Fonari blow glass through his mouth and nostrils into something quite amazing. BARCELONA……………Seeing Gaudi’s work is a must here and this can be done on our highlights and shopping tour. However, for me, not to see Montserrat (as featured in a previous blog thingy) would be a real shame so I highly recommend the Barcelona and Montserrat tour. It is the BEST of everything. LIVORNO……………..Pretty much the same applies here. Do you see The Leaning Tower Of Pisa or Florence? Answer, BOTH.. This is the cruises most popular tour as many guests take the Florence and Pisa Tour. You will not regret this or any other of the recommendations I gave you. Please let me know if you need further information and I am looking forward to meeting you. BELLA – It is indeed a shame that some people feel they can judge Carnival without even trying our product. I can understand people liking different lines or styles of vessel but to make a face when she heard Carnival is a real shame. Do you know here name, if you do, tell me so I can make a face. I mean, I have never met her but why should that stop me. Thank you though for your support to our great company and please keep reading the blog. CATHY SNYDER – Scottie drove his car home to Newcastle as I would to my home as well. Oh, well a man can dream. What’s your favorite car? BIG ED – Feeling much better now, mate. I have a special photo for your collection, it will be ready in a few days. How is Mrs. Big Ed’s fear of flying. Do you remember the A TEAM where MR T used to get a glass of milk before he would fly and it would have a sleeping drug in it? Could we do the same to Mrs. Big Ed? DON IN KENTUCKY – Thanks first of all for reading the blog on a daily basis, I am honored (spelt correctly). Let’s answer your questions. All our Destiny-, Conquest-and Spirit-class ships have sushi bars which are open serving complimentary sushi from 5 pm – 8 pm. On the Carnival Freedom, since we are in Europe, we also serve mezza and tapas as well. Most cruise directors with Carnival will work from four to six months before taking a six- to eight-week vacation. More often than not, they will return to a different ship but sometimes if things have worked well there, the cruise director will return to the same ship. I will be working all the way through to November on the Carnival Freedom which is unusual but all will be well. Thanks again for reading the blog and I hope you continue to do so. Just a quick question for bloggers. Who have you had as cruise director that really impressed you? Let me know. MAYLEE – Just before I read your comment I was about to tell a blonde joke but with you and Heidi here I am outnumbered, so I surrender. Best to you and your DH. KIM NOTTINGHAM – The bloggers cruise continues to be a hot topic of conversation, however, your one-year-old may have to sit on Mummy’s knee as I bestow gifts upon her and while she watches the best entertainment at sea. I will be posting soon all the planned activities but keeping a few surprises up my sleeve. Are you going to sail with us? I hope so as I promise it will be a fantastic cruise vacation. SHEL – Please return the greetings to your esteemed travel agent Jackie whom Heidi and I remember fondly. Please tell her that we look forward to seeing her next year aboard the Carnival Splendor. DAVE – One of the nicest surprises from this blog thingy has been the ability for some old cruise ship friends to get back in touch with me and that certainly applies to you mate. How are you? Congratulations on finally meeting the girl of your dreams — and she is a dream as I can see from the Web site. I have great memories (most of which can never be printed in this blog) of our time together on the Holiday. I was a young social host and you and Doug were this young, hip duo who every guest and every crewmember wanted to know. I remember my favorite song you did was Jersey Girl! How is Doug these days? I wish you a great contract on the Princess ship and I truly hope we meet again someday. Cheers, mate. GLENN AND LEANNE – I am so glad that my sickness is over. It was so hard to do a job like mine when you have just redecorated the bathroom in orange with a splash of lime. The Olympic Stadium is close to the vessel and there will be photographic stops there on our highlight tours. Later in the day you can take a cable car ride over the stadium itself. Just think you will be here soon to enjoy all those Platinum Perks and I see you also booked the Carnival Splendor…..Congratulations. See you soon. GLENN – I highly suggest you book a transfer on the Internet from the airport to the ship. Doing this takes away all the hassles and worries you have mentioned in the comment you posted. Many guests do this and I do recommend this to you as well. I was real “crook“ mate but all is well know. What’s happening in Neighbours? Do they sell Aston Martins in Australia? PAULETTE’S MUM – It would be extra icing on my cake if your daughter could be in the cast as well. 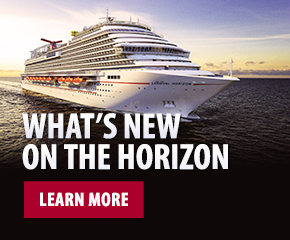 However, the Carnival Splendor will give us all a great chance to catch up and enjoy amazing ports of call. LINDA FROM MICHIGAN – Hope you are enjoying a Michigan spring. I am sure you will have a super cruise on the Crown Princess and next spring. Who knows, you and I may finally meet. I will keep blogging if you keep reading. My best to you and Gary. MEDIUM CRUISER – It is very important that you send me a note once you are onboard for your parents’ anniversary. Since it is their 50th, I will make sure it’s a cruise they never forget. See you in August, mate. 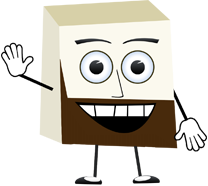 JOHN FROM NEW JERSEY – I am glad you got to hear about the blog thingy mate and welcome aboard. I remember your cruise very well and maybe one day soon we can do it all over again. Please keep reading and its great to welcome you along with 249,000 other hits. The sales for the Carnival Splendor are going great and so of course are next year’s voyages for this amazing ship, the Carnival Freedom. She will be back in April next year and will continue this incredible Greek/Turkey run and of course the massively successful Grand Med. Have you done Greece now, then maybe its time for the Grand Med or visa versa? Anyway, you have two ships to choose from next year. Let me know if you need help in making your mind up which one to choose. What else has happened since yesterday’s blog thingy? Hmmmm. Ah yes, I had a chat with a guest last night in between shows who really had me laughing. I have no idea of their name, it was just a quick chat in the lobby but over a very strange subject. I was walking through the lobby, it was about 9:30 pm and there was a bit of a commotion going on around the lobby dance floor. There in the middle, surrounded by loads of laughing and one or two dismayed guests, stood a very……..ummmmmmmmm, let’s say buxom lady who was dancing. Which is fine, except she had decided to remove her tent……sorry…….her blouse and was now dancing in a skirt and bra! She told me she loved me but then saw Gary who is 120 pounds of skin and bones. She smiled like she had just found an unlimited supply of Mars Bars, forgot about me and gave Gary a hug so tight his face was pressed between two huge, massive, gigantic………………….%$#@. After the hug, the lady was not the only one smiling as Gary had a smile as big as……….well….the things that caused him to smile. That was that, the lady put her blouse back on and walked into one of the glass elevators and as it went up she received a massive round of applause from the 200-plus people who had watched the whole thing. I took a photo of this but I have been told by my editor that it would be better if we do not put this on the blog thingy…and besides…………I don’t think there were enough pixels in my camera!